It’s been two years since I’ve talked to the members of Emerald Rose. At that time, they all had day jobs and pretty much played locally. However, allot has happened in the interim. Achieving the dreams of most indie bands, Emerald Rose made the jump to quitting their day jobs to concentrate just on the band. They got a tour van and are touring constantly, including NYC. I talked to “Mad Man Morris”, AKA Larry Morris, about everything that has happened to Emerald Rose since they’ve taken that next “big step” on the indie band ladder. The band is proof that an indie band can succeed on their OWN terms, not relying on a major label to call the shots. E.C. : First of all, tell me about the new live CD! What was the group mindset on the project? Were you looking for a sort of 'greatest hits' or an 'intro' to Emerald Rose? You once said that live shows were, "the heart-blood of this style of music, the more live, the better." Or to just show what the band is capable of in the live arena? Larry: We'd been told by many fans that we NEEDED a live CD, because our studio recordings just didn't adequately capture the essence of the band. That's why we chose to do this, rather than focusing on another studio album. We managed to capture some really great tracks at the Harvest, thanks to Cayce and Rob (Schoenborn) and we wanted to capture that live energy. We think it worked! E.C. : With two albums under your belt and a large traditional repertoire, how did you decide the song lineup for the album? I imagine that you could have easily made it a double CD? Larry: We had many live tracks, but as with anything like that, some were much better than others. We felt that picking the best 13 and doing the required EQ and production work was the best choice. As it was, it was a still a struggle to get all this together before our Long Island tour...we ended up picking up the CD's in New York the day we arrived for our tour! E.C. 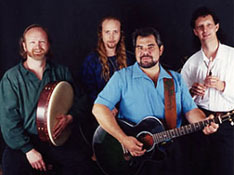 : Emerald Rose has always combined originals with unique arrangements of "traditional" Celtic songs. How do you guys go about finding a "new" traditional song to cover? Do you make a conscious effort to find songs that aren't done by every other Celtic band? Larry: We don't want to do the real chestnuts that everyone does, “Whiskey In The Jar” and that sort. We pick songs that speak to us, and that we believe we can add something to...like "Red Haired Mary" done in a lively pop style, or "Loch Lomond" done as a spooky blues number. Lately, we've got so much original material waiting to be worked up, we haven't been adding many traditionals. E.C. : The 2nd CD was very radio friendly? Were you surprised by the positive reaction? Not just on public radio, but elsewhere. Hasn't the band consistently charted? Larry: Well, like most indie bands it's very hard to get out on mainstream radio. We've had great success on MP3.com and other 'net portals, though, and there's a scattering of college and NPR-affiliate stations that are spinning our tunes. With "Fire In The Head" out, we plan on doing a significant radio promo campaign, and try to get some more widespread attention for our music! We'll also probably send a couple of our zany tunes to "Dr. Demento" and see if he likes 'em. E.C. : It has been 2 years since our last interview-have things exceeded your expectations regarding the band? Did you ever imagine that you would have 3 CD's out, a tour van and playing NYC? Have you re-examined your goals for the band? Larry: Everything that happens is a surprise these days! I'd say that in the last year, our expectations have gone from "hopefully optimistic" to "passionately determined." Things got more serious when some of our "day jobs" went away, and now we are focused on making the business end of this entity work. We have plenty of music, and really enthusiastic fans...so now it's finding out how best to pay the bills. E.C. : A couple of questions about songwriting…Arthur is the most prolific songwriter in Emerald Rose in terms of sheer output. And you seem to be in that niche of "funny/silly" songs. Can we expect more new songs by Brian or Larry on the new studio album? Clyde has picked up bass since our last interview. When will he submit an original song for Emerald Rose? Perhaps a "Gothic Trilogy" (firmly tongue in cheek)? Larry: Clyde insists on being coy about his songwriting contribution, though he's slinging bass lines pretty confidently now. We've got a great new song from Brian about ready to go: "Urania Sings", plus a few more from both Arthur and Larry. We're all working together pretty closely on arrangements and lyrics, so many of these songs end up being group-mind experiments. E.C. : In our interview 2 years ago, I joked about getting that "tour van". Since then, Emerald Rose DID get a tour van and have made good use of it. You've made it up to NYC and down to Florida. What do you see as your future touring plans? Do you have an eye on any western dates? Larry: Having the tour bus is great! We call her "Epona" from the Celtic horse-goddess, and she's really made touring possible for us. We're planning on mostly southeastern regional touring, with an occasional venture northwards, but that could change if we get a really good opportunity for a festival or big convention. E.C. : Speaking of touring, you guys have been gigging ALLOT lately. How does this fit in with doing a new studio album? What is the time schedule for the new (studio) album? Larry: Trying to reach breakthrough with a band is always a mad scramble to do too much in too little time! We'd love to have a new studio CD out this year, and we'll see how many tracks we can put down in between the tour stops. Luckily, we can do a lot of the raw recording and premix in our basement now, so that should help with time. We'll be releasing a compilation of our Celtic-theme songs called "Celtic Crescent" in the next month or two; that'll have a couple new tracks as well as material drawn from our previous CD's. Between that and "Fire In The Head" we're hoping to get a good product sales stream going. E.C. : Finally, is a European tour ever in the picture? Larry: Only if we can score a pretty big-name festival who's willing to pay the airfare. That's certainly not out of the question, though...and paying a visit to some of the Celtic lands as a band would just be too cool!